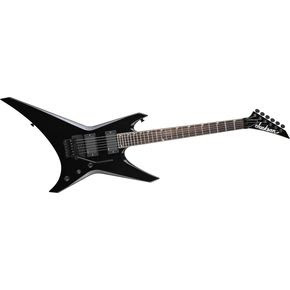 Jackson Guitars originated in 1980 when guitarist Randy Rhoads approached Charvel with an idea for an individualized guitar. The collaborative design effort between Rhoads, Grover Jackson, Tim Wilson, and Mike Shannon resulted in the creation of the Concorde, an innovative revamp of the traditional Flying V. The Rhoads designs were such a departure from Charvel's Stratocaster based brethren that Grover elected to label them with his own name. 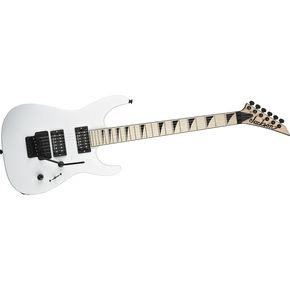 Throughout the heavy metal heyday of the 1980s, the Jackson brand was associated with high-quality, American-made, custom instruments, and was endorsed by many popular guitarists of the period. In addition to the original Randy Rhoads models, the 1980s spawned distinctively designed Jackson models such as the Soloist, King V, and Kelly, all of which remain icons of the brand. The 1990s brought changes in musical trends, and brands like Jackson began producing inexpensive, Asian-made versions of their staple designs in an effort to make their products more attractive and accessible to lower end buyers. In the Fall of 2002, Fender Musical Instrument Corporation purchased Jackson/Charvel, and U.S. operations were moved to the Fender factory in Corona, CA. Present day Fender era Jacksons (and Charvels) are being produced at the Corona works. 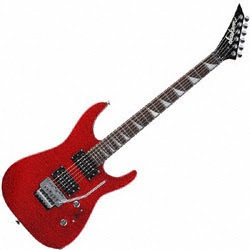 From the early beginnings until the present day, Jackson Guitars is known for its slender, elegant designs, and feature aggressive motifs that are popular with hard rock and metal musicians. Soloist: A neck-through body with the superstrat body design. Dinky: A smaller superstrat, 7/8 the size of a strat. 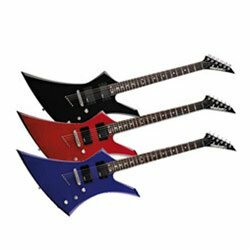 King V: A symmetric 'V' shape with long pointy wings, originally designed for Robbin Crosby of Ratt, but popularized, through prolific use, by Dave Mustaine of Megadeth, who had a signature model, the KV1. Phil Collen PC1 Signature Dinky: Dinky style with a Jackson Sustainer/Driver pickup in the neck position, DiMarzio HS2 Stacked Humbucking Pickup in the middle position, DiMarzio Super 3 Humbucking Pickup in the bridge position, Floyd Rose original locking tremolo and gold-plated hardware. It was followed by the short lived PC3 model, a moderately priced version featuring DiMarzio HSS pickups and a Wilkinson floating vibrato. 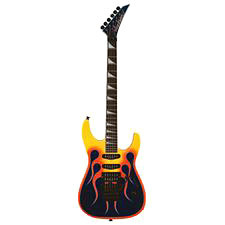 Phil Demmel Demmelition V: A signature guitar based on the King V, with slightly changed wings in the form of cutouts. Adrian Smith San Dimas: A signature guitar based on the 1980s Jackson custom shop models produced for Iron Maiden's Adrian Smith. "Professional Series" is a tag that denotes the Japanese-made versions of many popular USA models. All Jacksons with "Professional" on the headstock are made in Japan. "Performer" is a tag that denotes Jackson's low end models, produced during the mid 1990's in Asian factories (initially Korea, and later Japan).